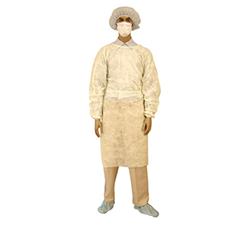 A complete assortment of apparel from head to toe suitable from industrial to ultra clean environments. 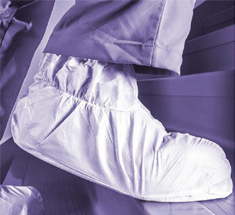 Choose from Tyvek®, Dupont Suprel®, KleenGuard®, Breathable Micro Film, SMS and many more. 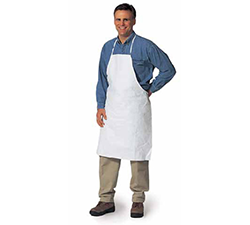 General Purpose Apron: Bound seams and neck with Tyvek® ties closure at waist. White. 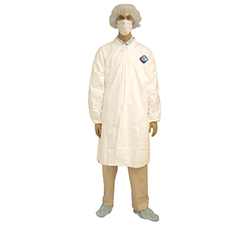 Vinyl Coat Apron: Ideal for applications in food processing/handling, laboratory, electronics, medical, pharmaceutical, chemical processing. 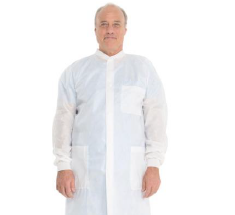 Isolation Gowns: Wraparound gown provides basic coverage. 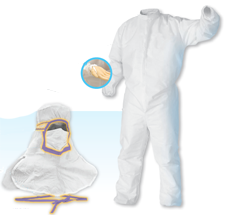 Offers light splash resistance, shields clothing, resists penetration of dust, dirt and grime. 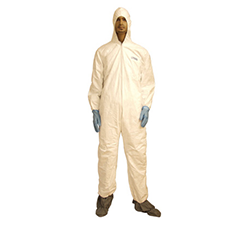 Tyvek® IsoClean Coveralls: Made from Dupont™ Tyvek® brand flashspun polyolefin protective material. Comfortable, lightweight and durable. 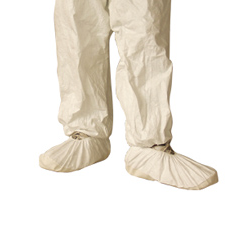 Tyvek® Coveralls with Hood & Boots: Full-length zippered front with attached hood and boots. Elastic face opening, and tunnelized, snug-fitting elastic at the face, wrists, ankles, and back-waist. 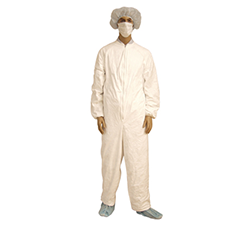 Polypropylene Labcoat: Spunbond polypropylene material acts as a barrier against foreign particles. Available with or without pockets. 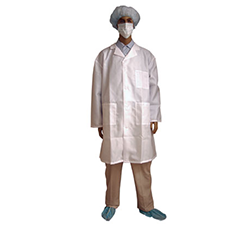 SMS Labcoat: Made of high-quality, fluid-resistant, tri-layer spunbond meltblown spunbond (SMS) material. 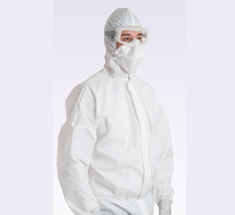 Tyvek® IsoClean Frock: Bound seams/neck with set sleeves and covered elastic wrist. 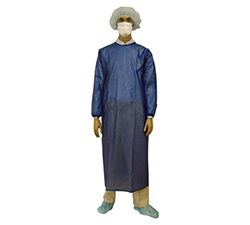 Reusable Apparel by Alsico USA: Alsico manufactures stock and custom garments in a wide selection of fabrics to aid in the prevention of critical environment worker contamination. 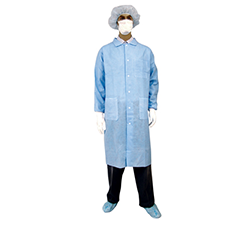 Reusable Apparel by Worklon: Worklon manufactures a full line of cleanroom and controlled environment apparel and accessories for the ultimate defense in particle control and electrostatic dissipation. 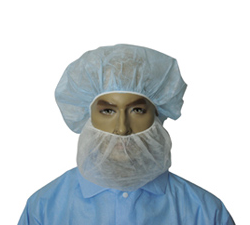 Beard Covers: Lightweight spunbonded polypropylene offers comfort and breathability. 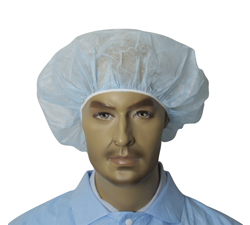 Bouffant Caps: Made of 100% spunbonded polypropylene, caps feature a synthetic, nonlatex band stitched in with soft floss for a comfortable, secure fit. 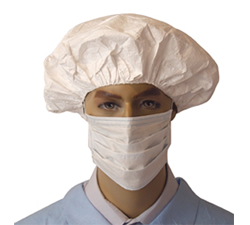 Tyvek® Bouffant Caps: Excellent barrier to dry particulates including asbestos, lead, dust and more. 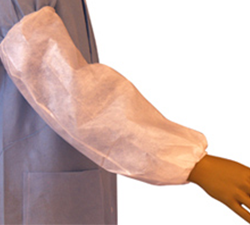 Sleeve Protectors: White polypropylene or with polyethylene coating fabric provides excellent barrier to dry particulates, nonhazardous liquids, and microorganisms. 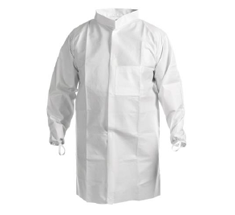 Tyvek® Sleeve Protectors: Bound seams, covered elastic. 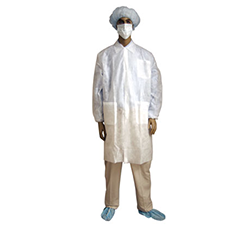 Available sterile and non-sterile. 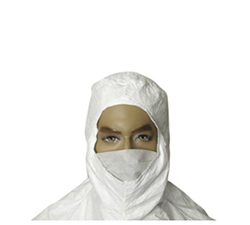 Tyvek® Eyes Only Hood: Provide maximum particle containment. 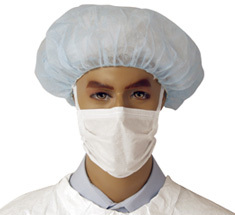 Facial mask completely covers head, neck and shoulders, leaving only the eyes uncovered. 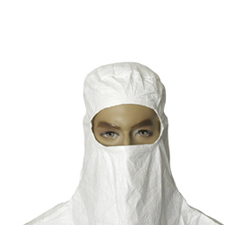 Tyvek® Open Face Hood: Designed for superior comfort and particle containment. Available as Class A clean or without special cleaning. Conductive Shoe Covers: Made of a nonwoven substrate with a conductive carbon concentrate with black conductive polyester 3/4" wide strip. 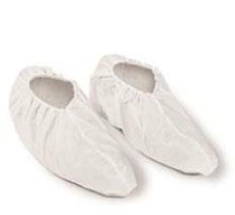 Fluid Resistant Shoe Covers: Co-polymer shoe cover provides excellent barrier protection against fluids. Most economical shoe cover is also non-particulating. 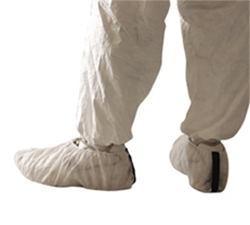 Non-Skid Spunbond Shoe Covers: Spunbond Polypro shoe covers are made of highly breathable material for added comfort and protection. 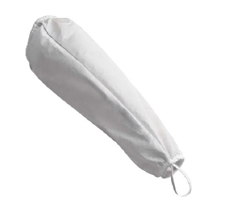 SMS Shoe Covers: Shoe covers made of durable 3 layer SMS polypropylene. The 3-ply material provides greater particle control, comfort, durability and fluid resistance as well as better traction. 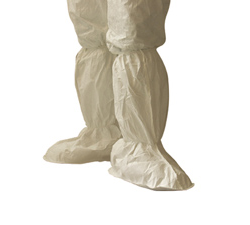 Tyvek® Boot Covers: Processed in a certified ISO Class 4 (Class 10) cleanroom, antistatic treated, and packaged in durable, antistatic bags. ISO Class 5 (Class 100) compatible. 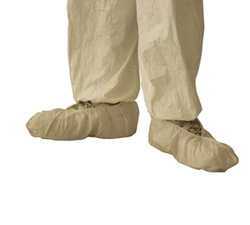 Tyvek® Shoe Covers: Constructed of Tyvek® which is tear and moisture resistant, these shoe covers provide all-day comfort. Kimtech Pure* A4 Sleeve Protector: with CLEAN-DON* Technology. 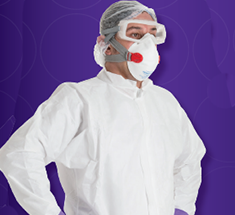 Kimtech Pure* A5 Coveralls: now available in bulk packaging, and the NEW Kimtech Pure* A5 Clean Integrated Hood and Mask can guard against the risk of contamination. 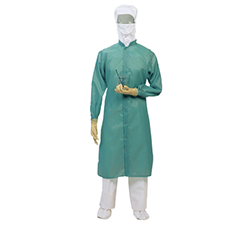 Kimtech A6 Hooded Coveralls: with innovative folding pattern to facilitate and reduce gowning time. 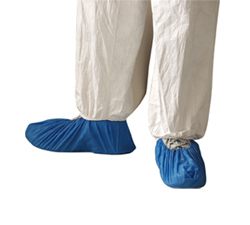 Kimtech A7 Ankle High Shoe Covers: protect the shoelace area, closing a gap that could be a vehicle for contamination not addressed by traditional shoe covers. 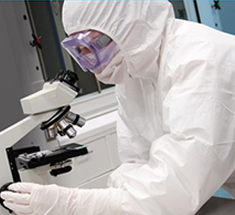 Kimtech A7 Lab Coats: Available in bulk cleanroom packaging, the lab coats are easy to don and doff and are recyclable via RightCycle* by Kimberly-Clark Professional*. Kimtech A8 Coveralls: made with a lightweight innovative fabric that moves with the worker. 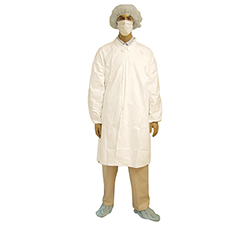 Kimtech A8 Lab Coats: made with a protective 3-layer SMS fabric and are recommended where there is the potential for light fluid contact. Kimtech A8 Shoe Covers: 4X more grip than leading alternatives, the NEW KIMTECH PURE* A8 UNITRAX* Shoe Covers do more to protect workers. 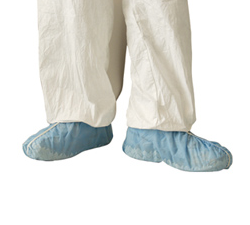 CleanMax™ Coveralls: provide the comfort, quality and protection you expect from disposable protective apparel.